If you've been on the fence about buying EA Sports Active, there's no better time than today if you're reading this on Tuesday, October 13, 2009. That's because EA Sports Active is today's Amazon Video Game Deal of the Day. You can save $15 off the retail price and help a great cause while you're at it. 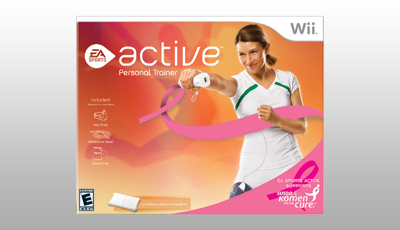 EA Sports Active: Susan G. Komen Breast Cancer Awareness Edition is a special limited edition of the very popular Wii fitness title from EA Sports. The actual game is pretty much the same as the original (see a review of EA Sports Active here). The difference, of course, is that some of the proceeds will go to Susan G Komen For the Cure. EA Sports Active takes interactive fitness to new levels by allowing you to customize your workouts, choosing from a variety of aerobic, upper body, lower body, and athletic exercises.